This brand's philosophy:"subtlety and sophistication, high quality materials, innovation and modernity" says it all. One of the creators of the Florentine "Alta Moda", but Ferragamo's essence remain certenly his spectacular shoes! A jewellery trend-setter since 1884. From small leather goods Florentine company to the world wide respected fashion brand! Pomellato yewellery-jewellery out of its formal wear. One of the leaders in Italian yewellery sector. The philosophy of Tanino Crisci shoes:"We're the most descreet note of a style of a person". An elegant style of one of the oldest Florence's noble families. The Burberry Check, registered as a trademark, is the world known class brand. The Florentine Roberto Cavalli brand covers the complete high class necessities from accessories to "Alta Moda" clothes. Well known Prada luxury goods from accessories to clothes. The founder of the French luxury and one of the world's top fashion houses. The brand of known Italian fashion shoes. Gucci and Prada at 30% to 50% off the retail price! Forget haggling for deals on the Ponte Vecchio. The real bargain hunters now head to such designer outlets as Prada and Gucci, which have become a shopper's paradise. Join this tour and get ready to buy another suitcase to take your bargains home - Happy Shopping! Between 5th and 16th of August, the Prada outlet store is closed and therefore will not be visited on this tour. Calling all Shopaholics! 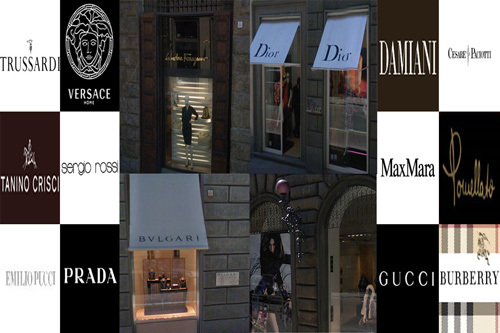 Travel in style as you visit the outlets of the most prestigious fashion companies on your luxury private day tour from Florence. You'll have the opportunity to hunt for bargain steals with reductions from 30% to 50% off the recommended retail price.